This Old German cursive was taught in most German schools from 1915 – 1941. To create a modern handwriting script, now known as the Sütterlinschrift (Old German hand), the graphic artist Ludwig Sütterlin was commissioned by the Prussian Ministry of Science in 1911. When the Nazi Party banned Sütterlin, it was replaced it with Latin-type letters. However, many German speakers, such as the generation before me, had been taught only Sütterlin and therefore continued to use it well into the post-war period. 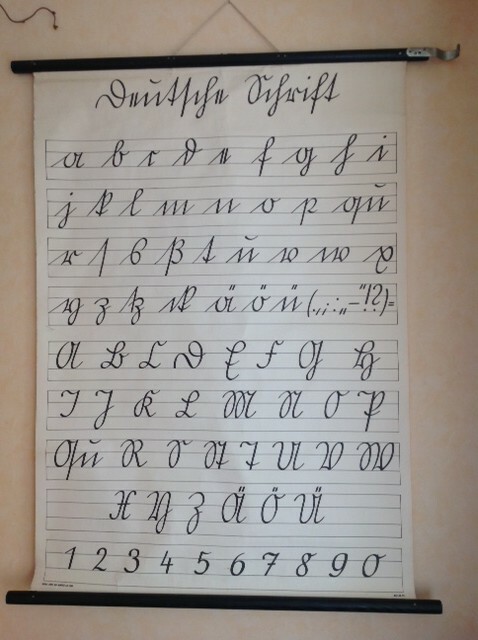 In 3rd grade, we had to learn Sütterlin, a mandatory part our our education. I’m very glad I learned it, because later in life, I was able to decipher old postcards, my father’s documents, and so much more. 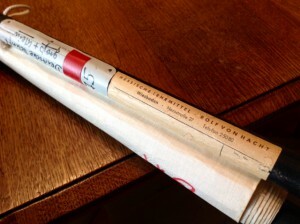 I found this Deutsche Schrift (Old German writings) teaching supply at a private flea market in Oberursel the other day. It had come from an elementary school in Oestrich-Winkel (near Rüdesheim), where the seller’s father had worked as the Hausmeister (maintenance man) for many years. When the archives had to be cleared, he was given permission to take this one home. Now I’ve got it hanging at my place of work. This quote goes so well with an Upworthy video I had just watched. See for yourself how this 3rd grade teacher demonstrates what it is like to be discriminated in metaphors. A stateside reader inquired about a local guest house he used to frequent with his army buddies, while stationed at Camp King in Oberursel in the early 1960s. The name of the guest house was Zum Weißen Roß. I tried three different ways of locating this guest house – the internet, Oberursel city hall, and an oral source. This quest for a guest house, closed down more than 20 years ago, was an interesting challenge. The internet had only one source listing the name of the man, who had married the proprietor’s daughter of the guest house Zum Weißen Roß. Fortunately, this very long excerpt from a church archive also listed the guest house’s address. The second source, the city archives of Oberursel, I have sent sent an inquiry to by e-mail. Considering German bureaucracy (You want something from me! You need to wait! ), I would consider myself lucky to get a response at all. The most reliable source was our neighbor who has been around town for many years. 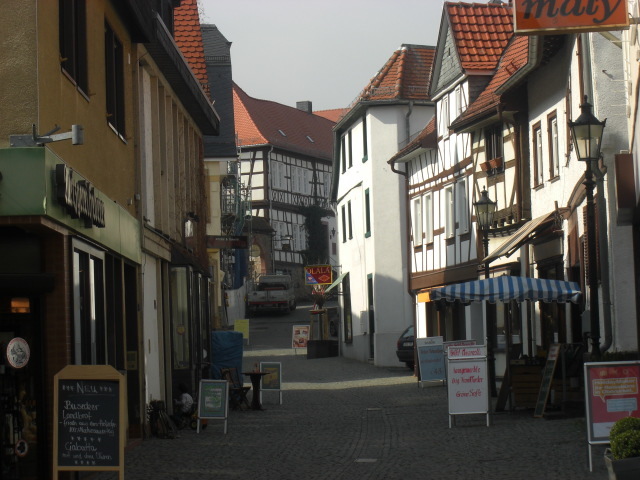 He is in his early 70s, but yet was not familiar with Oberursel’s downtown bars. He consulted another friend of his, who confirmed that the address I had tracked down on the internet was correct and that the guest house had closed its doors more than 20 years ago. He also mentioned that this bar/guest house was one of the so-called Ami Kneipen in Oberursel. 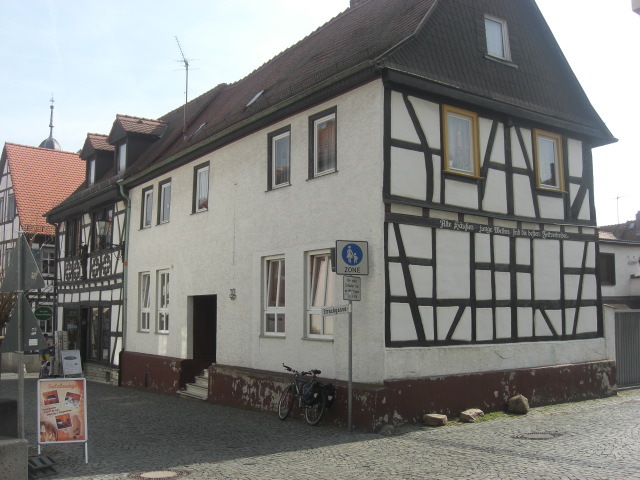 Here are some pictures, for old-time-sake, but I doubt any former patrons of this guest house would remember the outside after a hefty intake of beer, Schnaps, Jägermeister, and Korn. Taken in broad day light, probably with a new coat of paint, it might look mighty different compared to the time of day when the guys stumbled home after a night of partying. 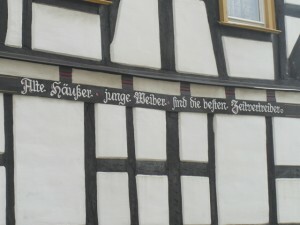 This old German writing reads: Alte Häuser, junge Weiber, sind die besten Zeitvertreiber. Translation: Old houses, young women, are the best way to spend your time. This post is dedicated to Fred S. – he is the one who inquired about the former guest house Zum Weissen Ross. Edit: The city archives finally responded on 12 May. There was also an apology for the delayed response due to staffing problems.I received a file in German detailing the history of the guest house. If anyone is interested, I will be happy to mail it to you.